Back during the old master times, if you wanted to become an artist it was expected that you attend a prestigious art school or atelier so you could learn from the best in person. Outside of this, one would struggle to develop as an artist due to a lack of available information. Times have changed significantly since then. Technology has leveled the playing field and allows anyone with an internet connection to access top-quality art education. From the comforts of our homes, we have access to high-resolution photos of master paintings which allow us to clearly see individual brush markings and cracks in the paint. We can learn all about the old masters who paved the way before us and the modern-day masters who are continuing to push the boundaries of what is possible with just paint and brush. And you can do all this without going to an art school. There is finally a valid alternative for those who do not want to invest in, or have the opportunity to attend an art school. In fact, there has never been a greater time to be a self-taught artist, and I only see it improving in the future. In this article I want to run over some of the reasons why you don’t need to go to art school to become a successful artist. Let me preface this with the fact I did not attend a prestigious art school, so my comments are based on observation, assumption and on the comments of art students. If you did go to an art school, feel free to add your thoughts at the end of this post. As with any school, you are bound by its beliefs and systems. This by itself is not a downside, provided those beliefs and systems align with your own. When you attend an art school, you will be expected to do things a certain way, learn the set curriculum and abide by their rules. The best schools will allow you some freedom along this journey, but many won't. If these beliefs and systems do not align with your own, then you will most certainly be left unsatisfied. Take a somewhat extreme example of a young student who wants to learn landscape painting using old master techniques. How much do you think that student would learn if they attended a modern art school which idolizes Andy Warhol and Jackson Pollock? The obvious solution is just to attend an art school which has the same beliefs as you do. But that is not so easy. A school's beliefs and core principles are not always obvious on first glance. You often need to be deep in the system before you clearly see what a school's beliefs actually are. In addition, most traditional schools face a problem of scale. They need more students to remain profitable in a competitive world which is changing rapidly due to technology. To get more students, they need to get more teachers. The more teachers you have on board, the more watered-down the core beliefs will usually be. The school shifts from a specialized focus, to a broad focus to attract more students. In its attempts to appeal to everyone, it appeals to no particular student. So the problem is not that schools have beliefs and systems in place. Rather, it is becoming increasingly difficult to find a school which has beliefs which align with your own. 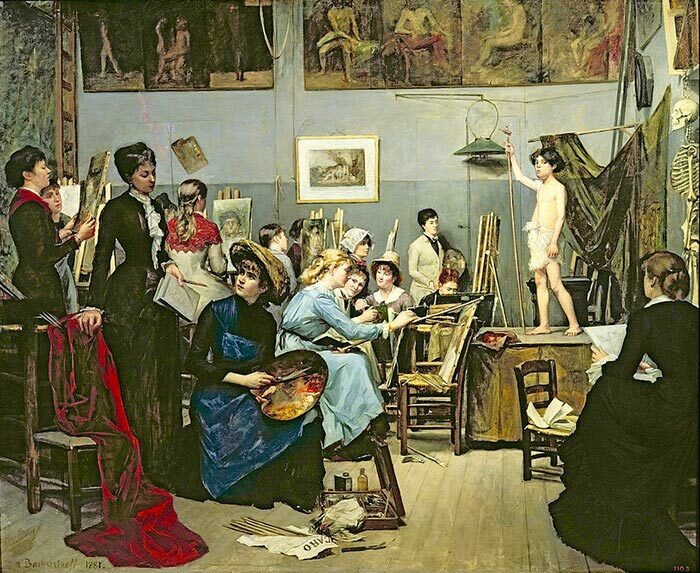 During old master times I imagine joining an art school or atelier was like joining a band of like-minded artists led by an inspired master of the craft. The direction and desired outcome was clear. Now, joining an art school seems to be for a qualification to have on your resume. Unless you are fortunate enough to live close to your preferred art school, then you would need to relocate in order to study in person. This is a serious commitment which students in many other industries are not faced with. I personally do not know of any local art schools which I would like to attend in Australia. I would need to relocate overseas. With most professions, studying comes with a reasonable assurance of some kind of work at the end of it. But not so much with art. Most graduate artists must make-do with whatever work they find after graduating, rather than what they initially set out to do. And this is a relatively positive outcome. The “safe” jobs in art are fiercely competitive and demanding. These jobs are mostly related to digital art and illustration for large companies. If you want to pursue a career in fine art, then there is no clear path. Some of the great fine artists of history were relatively unknown during their lives and suffered financial hardship. Yet they are revered today. So it is safe to assume that a career in fine art is an uncertain path to take. There is a significant risk that you will struggle to find work after graduating from a prestigious art school. This does not get spoken about enough. The best case scenario is you find some kind of commercial success early on whilst staying true to what you enjoy doing. The worst case scenario is that you come out at the of the system with no idea what to do with everything you learned, a large student debt and no job prospects in the art industry. Unfortunately, the latter seems to be the most common scenario. But we are all inspired by those few who do find commercial success doing what they love. To some, this hopeful outcome is worth taking the risk for. The school is taught by knowledgeable and inspired artists who share your vision. The school focuses on mediums which interest you. The school dives deep into specific areas, rather than touching on the surface of general areas. 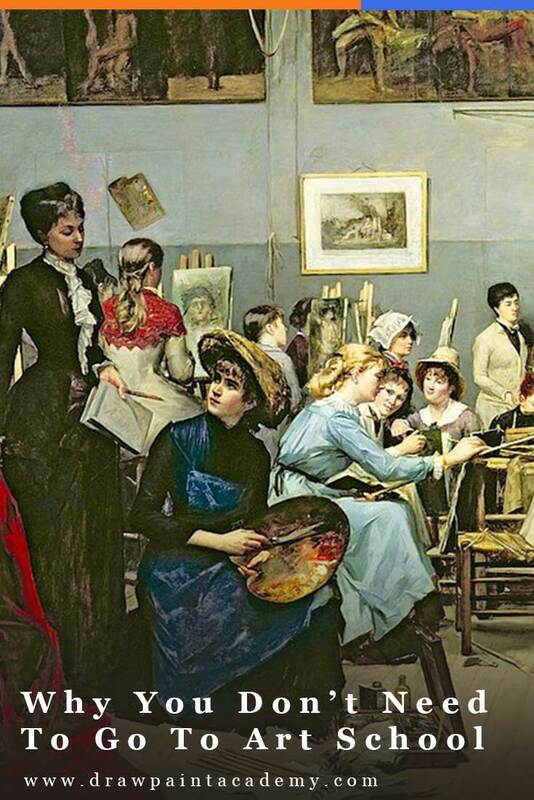 The school teaches art as though it is a trainable skill, rather than a commercial gimmick. The school does not have too many students. The school encourages the development of great artists, rather than imitations of the teachers. The school takes advantage of technology, rather than is naive to it, without losing focus of its core principles. For example, a traditional art school could take advantage of digital editing software, three-dimensional modeling and photography to push the boundaries of traditional art. But if there is too much of a shift towards digital art, then the core principles may be at risk of being watered-down. In addition to the above, you also need to be comfortable with the costs of attending and the risk you may struggle to find work after graduating. This is the case with many industries, but more so with art. I doubt there would be many schools which are able to satisfy most of the above criteria for you. What Is The Alternative To Art School? The alternative is you teach yourself. You get to determine your own path. You are free to choose what you study and who you study from. If Impressionism interests you, you could attend workshops of the top Impressionist painters, spend your free time reading about the old master Impressionists, practice Impressionist techniques and learn more about color and brushwork (which are of key importance to the style). But if you attend an art school, you will probably not have this level of freedom. 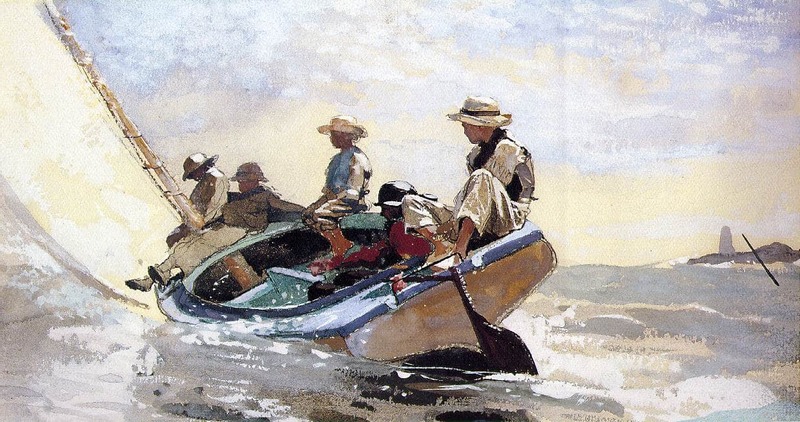 The self-taught journey is challenging but rewarding and artists like Winslow Homer showed you can go far without formal art training. What Are Your Thoughts On Art Schools? These have just been my thoughts on art schools and you may have a different opinion. It may seem like I am being overly critical of art schools, but that is only because I want to see art education thrive, rather than be crushed by the rapidly changing conditions. I would love to hear your thoughts on the matter, especially if you actually attended an art school. Good article. I did not attend, either, although I did commercial illustration for a living. I got a scholarship to Cooper Union, but our family couldn’t afford it. Someone I met along the way told me they went to a prestigious art school and they made them grind their own pigments. What a waste of time. IMHO. Sometimes I wish I had gone as now I am playing catch up with some basics, but as you’ve said, it’s do-able in today’s world. Really liked the article. I have tried to learn on my own and listen to other artists I have met. there is still a lot to learn as you never quit learning. I did not learn basic of drawing and such, but I do well with line drawings and photos doing my own thing from there. have learned about color also and am interested in learning more as I read and look at other media and such. such a fascinating journey. I respect your very articulate points of view you expressed very well. You however failed to point out the huge benefit of art schools in that they impose discipline, all be it the main discipline of deadlines and self discipline. I can only talk for myself being ‘arty’ I can get over excited in my discovery and I need to impose the discipline of getting the basics right before I go down the blind ally of discovery. To me this is why art school is important. Saying that I never attended art school but as a design teacher I was fortunate to teach art on occasions and learnt the need to teach fundamentals with discipline. I am thoroughly enjoying your articles you so lovingly post. I am. Retired so I seriously considered your online couse but hesitated because I won’t be able to get the one to one guidance from you, if only to ask you am I doing it right? Or what do you think about this idea etc. Do you think you could afford the time to offer for example short Skype video time for your art school, a service which I would pay extra for? Just a thought I wanted to share with you, it’s just a suggestion. As I implied I believe you are doing a great job and you ooze obvious passion for your work. Stuart – I completely agree. I did not touch on the discipline aspect of art school. Regarding your comments about one-on-one time, I usually do offer a bit of quick advice but it is becoming a struggle due to time constraints. It might be something I will consider adding in the future though. Thanks Stuart. Really appreciate the feedback. Thanks for this article (and many others). I find your information and insights valuable…especially as a self taught artist (fine art – acrylic painting). My opinions here are based on my own insights and not from any formal training. Because I work full time in an unrelated field (unrelated to fine art), it allows me financial freedom to pursue art without the stresses of having to pay my bills. It frees up my artistic pursuits in that I can paint what I want when I want. On the flipside, it is sometimes difficult to find time to paint and that can be frustrating. I have so many ideas and so little time. In my experience, its best for me to schedule my painting time in just as I would for anything else. Maybe because of my lack of a formal art education, when I attend art shows, I have to admit I don’t always understand some of the art I am looking at. As a “layperson”, I think some of the modern art encompasses a very small group of people who have gotten lost in their own little world that the majority of people cannot relate to. For instance, at a recent “Art Toronto” show, I saw a panel of what looked like pressed boards and the surface was completely coated in white paint. That’s it. Nothing else. And it was selling for $11,000 Cdn dollars. .Sorry but…WTF?! It’s times like this that I’m grateful to be part of the regular working class. Because of that, I hope that some of my paintings are relateable to everyday people. In some ways, I think I am fortunate that I do not have the restrictions of any one school of thought. For me that is an advantage. I can paint for myself. However, I do value learning new skills and keeping my mind open to learning new techniques to enhance my paintings. I have taken part time courses and workshops that definitely enhance my skills. I read about art and search online on a daily basis. All of these things are valuable to me as an artist. In summary I’d say that working full time and being self taught allows me a lot of freedom but finding time to paint can be an issue. On the flipside of that, having no money and/or having to create art that is not true to my own expression in order to make a living, these things would be a bigger issue for me. I look at my creative process as an artistic journey. It’s always evolving. That was a fascinating read! Your thoughts seem to align closely with my own. I ran into the same issue when I was working in accounting. I had the financial freedom and did not feel bound to paint for money, but time was certainly limited. Very interesting thoughts Ramona. Thanks so much for sharing. I always enjoy your articles and may I say first off that I believe in sharing and supporting others arts and I commend and thank you for sharing your experience and knowledge. I can go back to as far as elementary school and tell you the negative and limiting things art teachers have said and done. You’re right, most want you to crank out something that looks like their art and that only made me dig in my heels and do exactly what I wanted. I’ve had a teacher tell me that what I wanted to do was not possible so, of course, I went right ahead and did it. I’ve taken many classes over my life and I think the most positive thing Ive take away from it is that it’s inspiring to be with others that are motivated and inspired by creating. A whole class can be drawing or painting the same thing but everyone brings something different to the assignment. It’s exciting! Do I wish I’d gone to art school, no. As you’ve said there is so much available and for me, being self motivated and realizing that my art is and will always be an on going journey, has been the best fit for me. You never “ arrive”, it’s the journey. I have made money with my artwork but that has never been the motivator. Psychologically, doing something for money or to please some random judge at an art show, totally changes my desire to create. I do it for myself. I don’t know if anything I’ve shared will help another person but I say this. Create art for yourself but don’t miss the opportunity to be around others who create and share, support and encourage others. I very much agree. Although I have dreamed of being recognized, I am too unsure of my own talent to actually do a show, and art on demand for money just does not appeal to me. But, for my own pleasure I can create at will with the only critic being myself. Yes I made a nice living in a medium most people do not consider artistic but required some ability to see the result. Thanks for you insight because I never though anyone else thought as I do. Hi Devin. Your comment will surely help other artists! I found it to be a very interesting read. In response to your comment…. I teach art to children and one thing I love to teach them is to start thinking to themselves “ I am an artist”. It doesn’t matter what age you are and I’m sad that at 71 you’re still playing that negative record in your head. So… what is an artist? This is what I say “ if you are someone who is inspired by what you see or imagine and respond to that inspiration in a creative way, YOU ARE AN ARTIST! I so much agree ! Art school I feel is for a selected few, which is not the only route. Many great artists were self-thought. I still remember a visit in an art gallery and explaining naively that I was looking at some paintings to figure out the artist techniques ect. and snobbyly being answered that there were no comparison because the artist had made “Les Beaux-Arts school” . I was just astounded by the comment ! In my opinion and sadly, I find the art community snobs a lot of artists because they haven’t made Art School. From then on, I was even more driven in developing my own learning experience by reading and getting tutorials on line. Although my goal is not to become a full fledge artist, I pursue my learning path. As they say : Practice makes perfect ! You could be like me, you could be almost deaf. So things like classes and sessions where there’s a lot of information shared verbally would not be practical. Good article. Keep the faith. Very good article as always and excellent comments. I always wanted to be an artist but the life did not lead me that way till I decide myself. Three years ago, at the age of 55, I decided I was going to try to catch up to the lost time. I started with books, online searches, YouTube video and soon was totally overwhelmed and completely lost. I found non-credited evening art classes at our university and thought that they might help to make some sense. I took 2D design and Western Art History and both classes I enjoyed a lot. For me the discipline of having to attend the class, meeting deadlines, having the work reviewed by a professional and most of all, inspiration and motivation of the fellow students was worth the trouble and money but then money became an issue. Trouble is that it is expesnfive not only to attend an art class and workshop as much as it is expensive to offer it. Even, people like you Dan, have to spend resources on equipment, materials and time spent; time that is taken away form your painting. I often wonder why you do what you do? After over three years of painting I came to a conclusion that the best is to just relax and o what’s right for you, what you can afford and what makes sense. Being self-taught, I always feel looked down by the artists that list academic credentials, are represented by galleries, in other words have a name. Their art is often great but sometimes it’s not really and I don’t get why collectors go nuts about the name and poshy style but fine, their money, their choices. There is billions of people on this planet and there’s enough market to share for everyone. From March to Sep. this year, I made some efforts to market myself, mostly because all my friends and family keep telling me I should sell. Well, marketing is a total different story and I sure gained respect for so called professional artist and now I really wonder how they do it? How they find time to promote themselves, attend shows and sales, update their social media and still have time to produce artwork? I did sell a satisfactory number of pieces for someone who has no name whatsoever and is self-taught, but I figured out I can’t do it all. I also work full-time and came to the point that I didn’t have time to paint and therefore had not much to offer for sale. It dawned on me, that selling was not the reason I started to paint. Going professional is too scary for me. Competing with the Fine Art degree artists with the names that mean something to the collectors does not appeal to me at all. My art is not that good yet and it’s going to be a while till it’s going to get its own class and style. Watching some other emerging artist in my area and seeing some of them succeed brought me to the conclusion that I don’t want to produce artwork that sells. Once it sells, unless you have a big name, you are going to create stuff that is likely to sell because you need money to support yourself. Anyway, the last two months I have not produced an artwork that would even be presentable. I spent the time working in my sketchbook with no pressure but a lot of learning and pleasure in return. After two months, I missed bigger format and last weekend I spent painting something that just suited my fancy. Did that ever feel good! Also, after two months of doing exercises and practices it felt so much easier than before. Thank you for your article. i pick up lots of points from your articles. always wanted to study art but due to my job I could and when I retired at the age of 70 years I joined an adult art lovers class. I always loved the impressionist style and have started painting Srilankan landscapes in impressionist style and already taken part in 3 group exhibitions and getting ready for my fourth. your comments have helped me immensely. is there anyway to send you some images of my paintings to get your valued comments and feed back. Your articles are so useful. As for participating in a class, my experience is that initially I used to read painting instruction books a lot but my painting did not develop until I attended a small painting class for a short period- three months. It actually put me on right track and though me how to proceed. Then I studied by myself and saw a lot of instruction movies on youtube and purchased some CDs to learn at home. Recently I had an opportunity to attend a masters class again for only one month. I confess that during this one month I learned a lot which I could never find in books nor the cds I purchased. In fact my teacher showed me what I was doing in a wrong way. This is difficult by self-teaching. So I think learning from good instructors will expedite the learning time very much and teach delicate points which one does not know or knows but neglects. I just have to say thank you from of all us for giving of yourself and giving so many of us a chance to add comment to this conversation. It is very apparent that we all desire guidance in our pursuit to create art. I have taken many of the same avenues described herein and still seek others trying to achieve perfection in my results. It is also obvious to me that we should support each other in this pursuit. Wish we could all get together and make art. Keep the paint flowing ALL. I am a farmer. I want to paint my animals; goats and cows. I have never in 60 + years of life been to a museum to see art. I have a desire to see a masterpiece. I will one day. The only class I found was by an elementary art teacher who asked us (students x 6) what did we want to learn. She had never taught adults. I learned but as everyone knows, you can learn the wrong way. I have just recently discovered your site. It looks interesting. Now, to go to work. 2 babies born yesterday. 1 goatling and 1 calf. I birth animals in the winter. I will paint. I loved your article and comments. I am 79 and have been creating art my entire life. The commercial art world is so political that it’s difficult to break into it without papered credentials. I tried studying under an artist at 14, but quit when he got angry because I did an oil painting that he said that I couldn’t do, but admitted that it was better than he had expected. Later, in college, I started painting portraits, because I had no money for food and was tired of eating saltine cracker and catsup sandwiches from the condiments bar at the school cafeteria. After a time as a missionary and a stint in the military, I returned to college as a student in geology. I had been doing pen and ink artwork, while I was in the military and used this skill to illustrate my reports that I turned in to one of my geology professors. He was so impressed that he hired me to illustrate his professional papers. I ended up spending 5 1/2 years illustrating a major geology textbook, several lab manuals, guidebooks, as well as numerous professional papers. Along the way, I learned how to do scratchnoard drawings. At college, a sculpture professor, who was a friend of my geology professor, allowed me to audit one of his upper level sculpture classes. I was the only non-art major and was in the middle of my Master’s program in geology. The art professor was so impressed with my work in his class that he tried numerous times to persuade me to change my major and join him as a student in art. He didn’t understand that I loved geology as I did my art. I’ve had a successful career in the oil industry, and have continued my art on the side. I’ve learned air brush techniques from an art school, stained glass techniques from another school and watercolor techniques from a public school art teacher. His advice was, “paint, paint, paint!”, which I have done. I’ve sold my work in stores, galleries, and online and now that I’m “retired”, not really, I paint all the time. I once paid money for an online art course, but found that to be money not well spent. I’ve read books and articles, but really love the youtube videos from several artists. The great thing about them is you can watch them over and over until you “get it”. I also write and illustrate my own children’s books. I always have several paintings going at the same time, because I feel that my time is running out and I have so many things I want to paint, and stories to write and things to see and do. I am a self-taught wildlife and fine arts artist and writer and I don’t duck my head when I say that I’m self-taught. Life is great! I enjoyed being part of the discusion about art school vs. self taught but, have we moved on to a new topic? Maybe I’m just not receiving the email.